A star-forming region in our Milky Way galaxy. 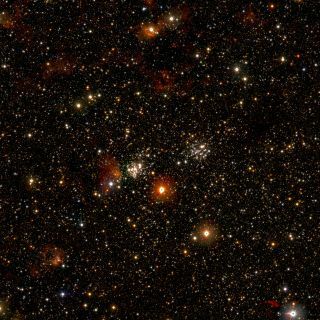 This image is a zoomed-in detail from a larger photo that captures 1 billion of the Milky Way's stars. More than a billion stars blaze bright in a new photo of our Milky Way galaxy snapped by an international team of astronomers. The new picture, which was released today (March 28), combines infrared images of the Milky Way taken during sky surveys by two different instruments, the UK Infrared Telescope in Hawaii and the VISTA telescope in Chile. The photo is part of a 10-year project that is gathering mountains of data to help guide future research, scientists said. "This incredible image gives us a new perspective of our galaxy, and illustrates the far-reaching discoveries we can make from large sky surveys," Nick Cross, of the University of Edinburgh, said in a statement. "Having data processed, archived and published by dedicated teams leaves other scientists free to concentrate on using the data, and is a very cost-effective way to do astronomy." Cross will present the image Thursday (March 29) at the 2012 National Astronomy Meeting in Manchester, the United Kingdom. This picture, which combines infrared images taken by two different telescopes, shows 1 billion of the Milky Way galaxy's stars all at once. The photo shows the plane of the Milky Way, which is often described as looking like two fried eggs back-to-back, with a flat disk in the middle. Earth is close to this disk's edge; the new image shows a cross-section through the disk as seen from our planet's perspective, researchers said. Because the image was taken in infrared light, it cuts through much of the Milky Way's obscuring dust, allowing astronomers to observe details of the galactic center. Large-scale structures are also visible, such as large clouds of dust and gas where stars are forming at rapid rates. While the new photo captures an unprecedented number of stars, it's far from a complete stellar picture of the Milky Way. Astronomers think our galaxy contains at least 100 billion stars, and perhaps as many as 400 billion. Getting all of them in a single frame would be quite a feat.